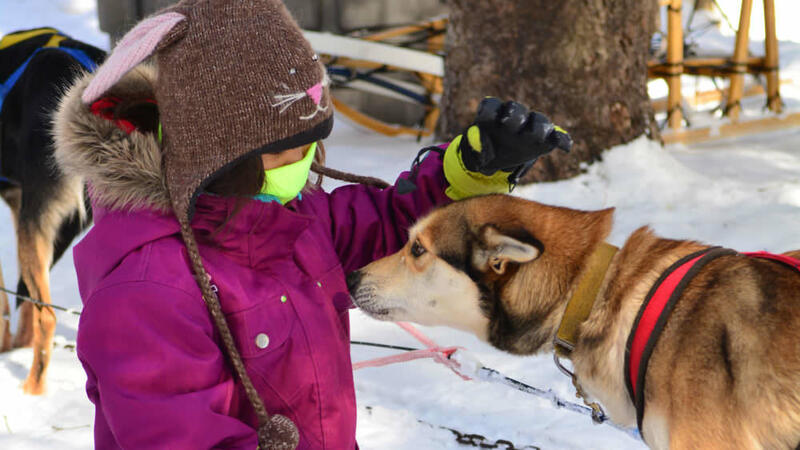 Mushing through the forest with North Ridge Ranch is a part of the Muskoka Signature Experience CollectionWinter Edition, a collection of Muskoka’s must-do experiences! There is nothing quite like the rush you get dog sledding through Muskoka’s mixed green forest, especially after a fresh snow fall. If you have yet to try this authentic Canadian winter experience, put it on your winter 2019 bucket-list. No experience is necessary, and the great white north is closer than you suspect. The friendly owners of North Ridge Ranch in Huntsville love their dogs, and their dogs love to run! will ensure you have the best afternoon dog sledding possible. At North Ridge Ranch they offer half day tours and one hour tours. The half day tour is approximately 20km and takes 2.5 – 3 hours. It is their most popular tour, which is why it is offered 7 days a week (reservations required). Halfway through the tour there is a stop to fuel up on hot chocolate and offers the perfect opportunity to snap a few pictures with your newly acquainted furry friends. For those with small children or who just want to get their feet wet in the sport, the one hour tour is a great option. The tour covers approximately 10km of wooded Muskoka forest, while still incorporating exciting twists and turns on the dog sled. Don’t be surprised if you’re left wanting more of this winter experience after the hour passes. If you have questions about dog sledding, odds are Brad and Leah at North Ridge Ranch have the answer. For more answered FAQ’s visit their website. In the meantime, here are some important things we think you should know before booking. The post Dog Sledding Through The Wintry Muskoka Forest appeared first on Muskoka Tourism. 4-Night SOLO Montreal Trip From $241 With Flights & Accommodations—Travel This Spring Or Summer!